The Boston Marathon is everything the hype makes it out to be and more. Sure it's the world's oldest and most famous marathon, but when we arrived in the city, I truly began to understand the magnitude of this event. The whole city is transformed into the mecca of all things running and every participant is made to feel like a total rockstar! It was a treat to go through the whole experience with my cousin Scott. Despite battling several injuries during his training this winter, he ran the race of his life, setting a PR (3:10:16) in the process. We had great support from my Aunt Hildy, Uncle David and cousin Rachel throughout the weekend and on raceday. After three days of cold and rain, Monday (Patriot's Day in MA) couldn't have been better. It was sunny with cool winds from the NW. We boarded buses at 6:00 am in downtown Boston and made our way out to the start. Hopkinton is a picturesque New England town, and since the 1920's, the official start of the marathon. Scott & I hung out at the Athletes Village waiting to be called to walk the .7 miles to our starting corral. After listening to the national anthem and getting buzzed by two fighter jets on a fly-over, we were off. The first few miles were crowded and it took until mile 3 for me to feel like I could begin to lock into my pace. Usually by then I slip into my groove and running the first half seems almost effortless. For some reason I never felt that effortless feeling. My legs were aching a bit and I could only hope that would go away if I kept plugging along. At mile 9, I ran by Scott's family and got a huge mental boost. Then at mile 10 I found my friend Brian (who I ran the MCM with last year) and his family. It was another rush of adrenaline that I needed at a point when I was starting to sense a building concern for the rest of the race. The next boost came around mile 12 when I ran through the Wellesley College "scream tunnel". This half mile stretch of the course features hundreds upon hundreds of female coeds screaming with every bit of air their lungs could push out. It's crazy. There's also a tradition at Wellesley where the ladies can't graduate until they kiss a runner during the marathon. So accompanying their screams are hundreds of posters soliciting "free kisses". I can tell you that I did not partake since I thought it was somewhat weird and wasn't quite feeling in the kissing mood. If you click the link, you'll see how the tunnel is an impressive display of noise. By mile 16, I was hurting pretty good. Whatever was going on with my legs began to intensify. A bright spot was finally seeing Tanya & Catrina for the first time. That boost was short-lived as I was about to enter the hills of Newton. This series of hills are not all that big, but where they come during the race makes them feel much bigger than they really are. I struggled here. I tried a mental trick of "roping" myself to someone who was running the pace I wanted to run and let them "pull" me up the hills. Unfortunately for me, those fine folks would go from 5' to 10' to 50' in front of me in no time flat. A low point came when I reached the top of the famous Heartbreak Hill. This is the last and largest hill. From there, the final 5 miles are almost all downhill into Boston. I reached the top and found myself a minute or two later staring at another large hill in front of me... the real Heartbreak Hill. I guess I miscounted the hills and instead of celebrating, I was back to huffing it up with a broken heart! There was no cruising down the backside of Heartbreak. I ran as fast as I could, but was still a minute or more off my pace. Instead of feeling deflated, I decided to relish the remaining five miles in all their glory. As you wind through Boston College and into the city, the crowds swell and their support is enough to send chills down your spine. I had written my name on my arm and those last five miles made me feel that all these spectators came out to cheer me on. At points I wanted to cry I found their encouraging yells so overwhelming (yes, emotions tend to run wild during marathons). I shuffled past mile 25 and had the running experience of my life during that last mile. The final ".2" miles come when you turn on to Boylston Street. It is slightly downhill and the crowds are 10 deep on the sides. The finish line is in the distance and I almost decided to just walk so I could soak it all in for as long as possible. I ran to the finish, but did decide to reward the spectators with a flying finish line jump. Remember now that my legs had been rebelling since the beginning. The picture above captures only part of the story. The "Finish Line" video below captures the rest! Check it out and prepare to laugh. 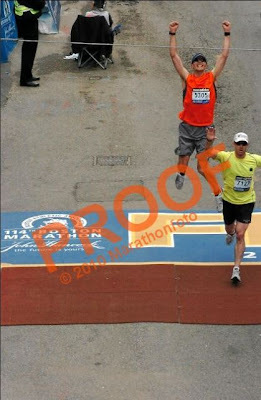 Look for the orange blob(me) on the left side heading for the "F" in "Finish". 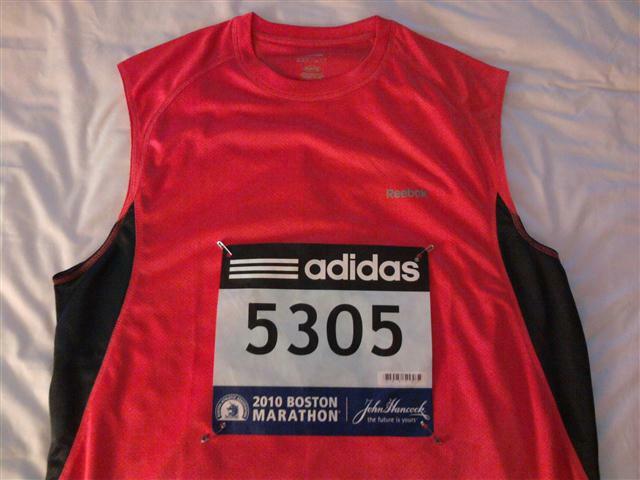 2010 Boston Marathon Finish from CO Runner on Vimeo. Crossing the finish line in 3:17:49 with a newly scraped and bloodied kneecap and hamstrings in spasm mode...I got my medal and met up with Scott to celebrate! With a week to contemplate the race, of course I would have loved to run better. In hindsight, I wish I didn't walk around the city so much on Saturday and Sunday. But like many times in life, you can prepare, work hard, and still have things not work out how you hope. Tomorrow is another day to savor the gift of running. With summer almost here, I'm so fired up for the early morning sun and to get out on the trails. The mountains are calling! In closing, my Boston experience was marvelous and I'm so thankful for the memories created...jump...crash...and all! We've been having a super fun weekend in Boston (albeit rainy and cold)! But now it's time to get down to business. The marathon starts at 10:00am EDT. The weather is looking great and I'm feeling ready. Here I come Heartbreak Hill!! 17 days until Boston! I've started my three week taper as the hard weeks of running are over. This picture was taken towards the end of my long run last Sunday morning. The sun had just risen and lit up the HR windmill. This landmark is probably the most famous one in HR. The Boston Marathon has a cool program where you can follow runners throughout the race. 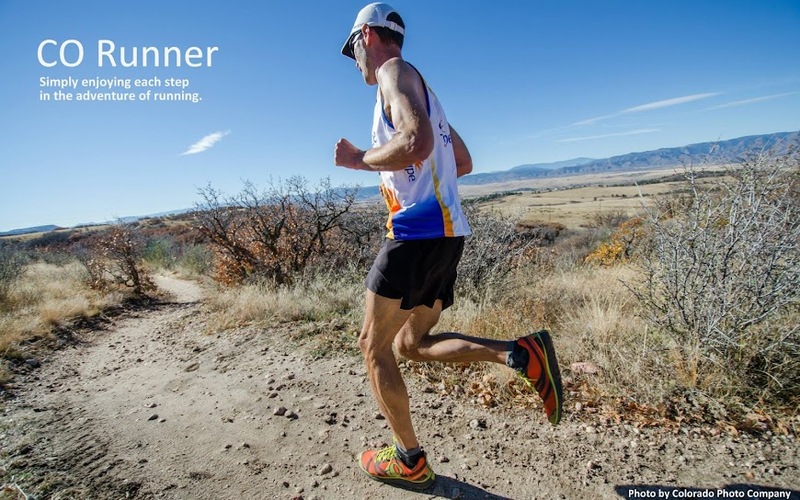 If you're interested, you can either go to their website on raceday and enter my bib # (5305) for a real-time update, or you can sign up in advance for the AT&T Athlete Alert Program and receive email or text updates at the 10K, Half, 30K & Finish. If I'm on pace for finishing in 3:05, I should be hitting the following splits at those distances.